Now with that out of the way, let’s get to the meat of this week’s edition. What did Chuck’s wife mean when she said those words? 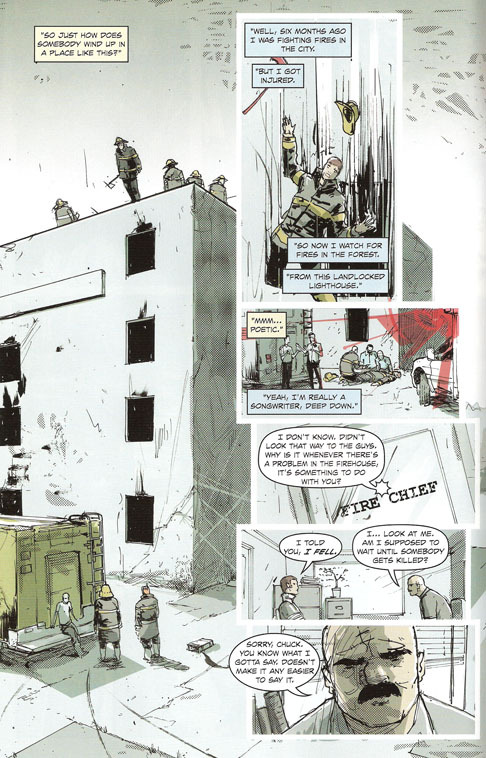 The answer lies in the very first issue of the series. 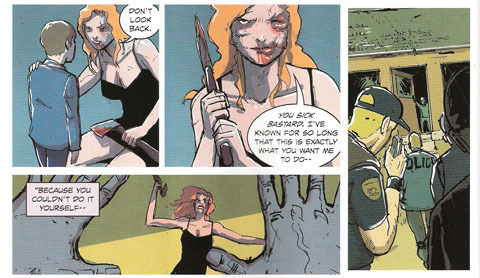 The scene in question is a flashback showing Chuck’s life before the incidents that make up the bulk of REBEL BLOOD. This scene shows the accident that led to Chuck being fired from his job and seeking employment as a forest fire ranger. 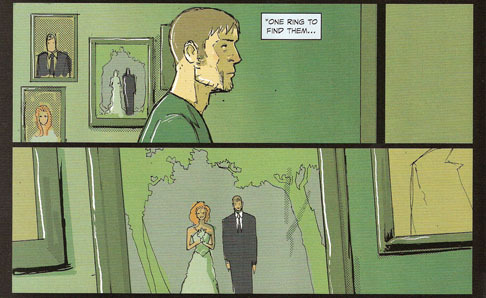 As we were starting to read the series, this flashback only appeared as expository back story for the main character. It helped define who Chuck was, but did it really define how he was interacting with the other characters and the events in the story? In other words, did that flashback reveal character? Yes, but not at the moment we read it for the first time. At that moment, the accident scene was actually foreshadowing. Foreshadowing is a literary device that lets the author hint of upcoming events in a subtle manner that isn’t readily evident at the time of the first reading. Foreshadowed elements only take on their full meaning once we reach the events that they relate to. In this case, it’s only when Deirdre utters those fateful words that the flashback is invested with its full characterization value. It’s then that we can fully realize not only why Chuck could find himself in the initial situation – he hates his life but lacks the impetus to let go, he needs other people or events outside his control to make the choice for him – but also why his mental breakdown took the form of a zombie apocalypse, that is a situation that backs him into a corner and forces him into the very simple alternative of “flee or fight”. That wasn’t the only instance of foreshadowing in the series either. In issue #2, we’re treated to another revealing flashback. Chuck has just put the kids to bed and is making his way to the bedroom to join Deirdre in bed. Notice how even in their weeding photos, there is an undeniable distance between the characters. People usually hug or kiss in their wedding pictures – especially the ones that end up framed on their wall – but not here. All we see are two solo portraits and a third picture in which Deirdre and Chuck don’t even touch. As a flashback within a flashback, these photos reveal that their marriage was doomed from the start. As foreshadowing, they announce their inevitable and surprisingly bloody breakup. The same principle is at work in issue #3 when in another flashback, Chuck is chatting with Mike as he’s signing up for his new job. Once more, we have a flashback within a flashback – this one was in fact discussed in Points of Impact – Week 10: Switching Tracks – and it shows again the chasm that separates Chuck and Deirdre. It also paints the portrait of a man ripe for doing something desperate. This scene could be also called ironic foreshadowing since Deirdre doesn’t “save” Chuck from himself in the end; she’s pushed into helping him commit suicide by proxy! At the same time, each of these instances could be said to constitute foreshadowing for the following instances, since the they’re structured as to build one upon the other, strengthening the effect the nearer we get to the end. In a way, this is a lot the manner in which mysteries are constructed: each clue is a foreshadowing element that hints and announces the final revelation by the sleuthing hero. In this case however, our poor protagonist Chuck is the most clueless character of all the cast, and it’s as a tragic figure that he’s led from one omen to the next to his bloody end. The mystery was meant for us – the reader – and it’s one so cleverly hidden that we didn’t notice it till the very end… unless you read all four books a second time! 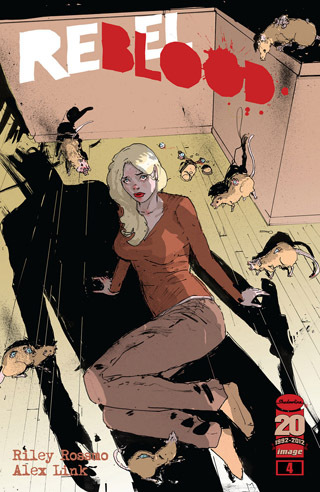 Thus, for their clever use of foreshadowing as a means to deepen characterization, Alex Link and Riley Rossmo score a HIT with the REBEL BLOOD series. Foreshadowing is a technique by which an author can present glimpses of future events by dropping clues in previous scenes. The foreshadowed elements often take the form of either visual symbols (the wedding photos) or analogous actions (the “accident”). When properly used – as it is in REBEL BLOOD – foreshadowing lends an additional layer of meaning to the plot and enriched characterization in a retroactive way: the reader thinks back to the foreshadowing scenes and these elements affect his interpretation of the scene he’s currently reading. As such, it can be seen as a form of retroactive exposition. Be wary however of lacking subtlety in your foreshadowing; doing so would give up too much information too early and your denouement would lose a lot of power. Hence, foreshadowing is a double-edged device: either you do it well and it enhances your narrative, or you screw it up and it kills your story before it even ends. Surprisingly none this week. Apart from the aforementioned REBEL BLOOD and the following Dishonorable Mentions, everyone was very middle-of-the-road adequate. Good creators doing a good job, no more, no less. No medals this time! BATWOMAN #10 by J. H. Williams III and W. Haden Blackman shows the same disappointing tendency month after month: it’s an indescribable narrative mess. 100 BULLETS’ Brian Azarello should call up WONDER WOMAN #10’s Brian Azarello and tell him that witty banter and pointless quipping alone do not make good dialogue. It needs some meaty characterization as well! And that’s it! See you next weekend! Don’t forget to comment on the ComixTribe forum!